When you move up and down in a lift you will notice that you can feel heavier or lighter. If you stand on scales in a lift your apparent weight changes as you start and stop moving. On a ship everything is moving all the time. To make things worse the things that are being weighed are often very light which makes them harder to weigh. 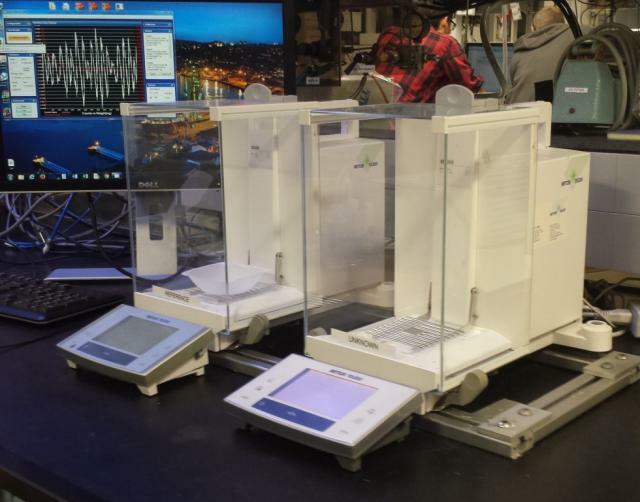 If you are at home weighing out ingredients for a cake it does not matter much if the fan is on, or someone shuts a door, however when you are weighing something with a very small mass like the samples we weigh for analysis these things make a difference. Even in still conditions the precise scales take a few moments to settle on the final mass. So how can we accurately weigh something on a moving ship? Well we have two scales one with a reference mass and the other to weigh the sample. The known reference mass has to be approximately that of the sample, but of exact known mass. A computer program takes away the changes in the apparent mass from the standard to help calculate the mass of the sample. It takes the average of many repeat measurements. As time goes on and the number of measurements increases then the accuracy and precision becomes higher.